Adjustable sensitivity Waterproof probe shaft. Probe Shaft: about 105mm. Low power consumption for prolonged battery life. 1 x Instruction Manual. Power Indication Light (White Color). Due to light and screen difference, the item's color may be slightly different from the pictures. Size: about 410 85 45 mm/16.14 3.35 1.77 in. best give a satisfied solution. Orders placed on weekend will. Power consumption: 270mW. To Other Country. 1 x Manual. 1 x TX2003 Pin Pointer. Compact and light for easy handling and carrying. 1 x User’s Manual. Specifications: Battery: Single 9 voltage alkaline or Ni-Cd Battery life: 40hours(Ni-Cd) 28hours(alkaline) Power consumption: Max. 270MW Working frequency: 22KHZ Standby current: < 8MA Working voltage: DC7-12V Working temperature: -15°C-45°C Resetting time: 0. Light, sound and vibration three alarm modes. Warning mode: sound / LED / vibration. Reset: 0.5s, auto. Battery: 6F 22ND 9V Battery (alkaline battery, NOT included). Temperature: -15~45. Color: black. The detector has been set to the optimum sensitivity level for most security scanning applications. Applications:Perfect for safety check and the detection of prohibited goods. Size: 41 x 8.5 x 4.5 cm/16" x 3.4" x 1.8". It can work in door, on sand, lawn, in soil. It is versatile and easy to use, small and exquisite. Small size pinpointer with holster, makes it be ultra portable and convenient. 1 Pinpointer. Three sensitivity levels with different LED indicators light, audio and vibrate alert. Has light and sound vibration alarm prompted the dual mode. size: 410 85 45mm. Power consumption: 270mW. the working temperature: -5 -55. Easy to operate, equipped with leather, for carrying. the working current: less than 50mA. Portabel Handheld Design, Easy to carry. Power: 9V stacked battery (not included). Net weight: 125G (without battery). Due to light and screen difference, the item's color may be slightly different from the pictures. Battery: 1 6F22 9V Battery (Not Included). 1 User Manual. Item Size: 19 15.5 67cm / 7.48 6.10 26.38in. Storage Temperature: -20~60° / -4~140°. Color: Black. Two optional alarm mode: LED light and sound alarm or alarm vibration. Pin 25 -60 mm;. 5, net weight: 450 g (without battery). Light weight, detecting probe area is large, fast detection speed. Size: length 411 mm x 85 mm x 45 mm. Advanced push and pull button design, the one-button operation can realize the conversion between sound and light and mute/vibration operation. Imported low temperature IC and the latest circuit design to achieve the most complete functionality with the smallest size. It is very sharp so that it can dig the earth easily. And this shovel can be disassembled for carrying easily. 1 x Folding Shovel. You may also like. Weight: approx.400g. Available to be disassembled. Pressing and holding the Desensitize button reduces the detector's sensitivity by about 50. The earphone jack lets you connect the earphone to the detector so that you can scan in privacy. percent,so you can scan for example near floors which contain large amounts of steel rebars. Only detecting probe is waterproof! Does not let the main body of the detector touches water! Detecting Wand is waterproof. With spotlight. Alarm mode: Audible. Now the sensitivity is maximum. Alarm Mode Audible. 2 modes for Detection Indication: sound alarm or vibration alarm mode. Handheld design, convenient to use. 1 Earphone. Detection Indication: Audio / Vibration. Sound Alarm Indication: ＞75dB. Detection Size: ＞2 10mm. Glass Clamp&Shelf Support. Drill Bits. Heat Shrink Tube. Door Handle Lock. Heat Shrink Wire Connectors. Ceiling Lamp. Projector lamp. Spiral Wire Wrap. 1 x Belt Holster. Battery Life: Carbon: 16 hours. LED light for low light uses. USA, Canada, United Kingdom, Austrilia, France, Germany, Spain, Ireland, Italy, Others. Canada, United Kingdom, Austrilia, France, Germany, Spain, Ireland, Italy, Others. Try this one. Battery: 2 6F22 9V Battery (Not Included). Material: ABS Plastic Aluminum. Item Size: 57 17.5 16.5cm / 22.44 6.89 6.50in. Model: GC2007. High sensitivity for improved small target detection, working indoors, outdoors, in the sand, on the lawn or in the soil. Find the speed and accuracy of coins, silver, jewelry and gold. 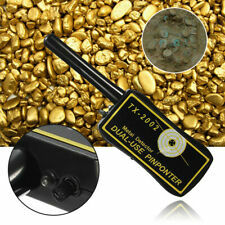 Handheld Security Detector Body Scanner Portable High Sensitivity New Tester. Pressing and holding the Desensitize button reduces the detector's sensitivity by about 50 percent,so you can scan for example near floors which contain large amounts of steel rebars, or scan in the places where only larger objects are required to be detected. The detector is versatile and easy to use.The detector's features include: Headphone Jack-let you connect headphones (not supplied) and operate without trouble. Adjustable stem-let you adjust the detector's length for comfortable use. Super Scanner. Easy to Operate. (Light, Sound, and Vibration Modes for Detection.). Model: MD740. Waterproofing: the unique seal design allows it to rain, soil to be used, or underwater depth of 100 feet. Low battery indicator: the built-in low battery sensor reminds you that when the battery power is low, you need to replace it. Super Wand. (Light, Sound, and Vibration Modes for Detection.). Model: MD750. Detection depth stability - (New Advanced circuitry maintains detection distance throughout the life of the battery). Communicates with vibration&light-(When a target is located the Vibra-iking750 signals with pulses of vibration and flashes of bright from white LED). Alarm will be increased based on targets' proximity. Indicator: Proportioanl audio / vibration pulse rate. Scraping blade for searching among tight soil. Automatic tuning. Tuning: Automatic. LED light for low light uses.